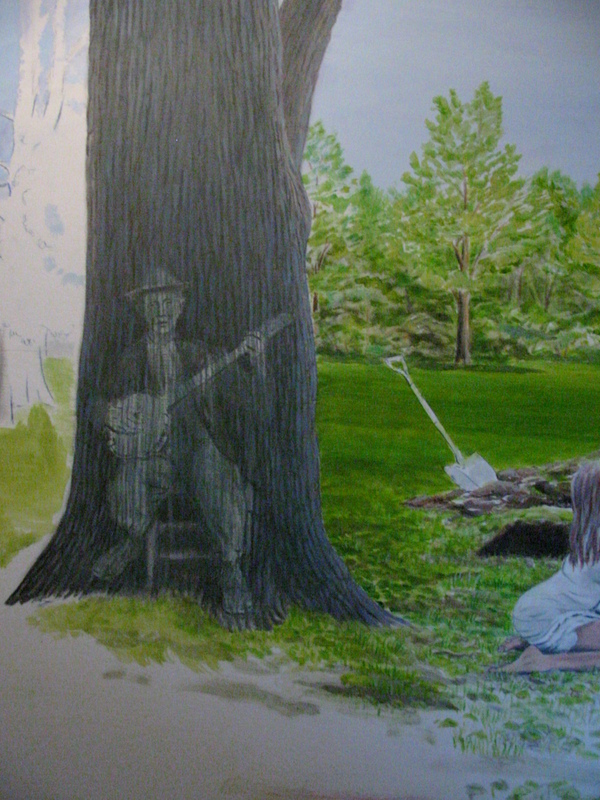 I thought I'd show you the process of how I do my bluegrass paintings. First let me say there is nothing more difficult than painting for me- it is not easy. This painful process starts with the lyrics and an idea and slowly progresses to a finished work. Pretty Polly is murder ballad. The scene takes place in a valley after Willie has "led her over mountains to the valley below." Polly is begging in vain for her life. Willie is standing over her with a knife. The spade (shovel) is pointing toward her. The far background is roughed in- it took forever. 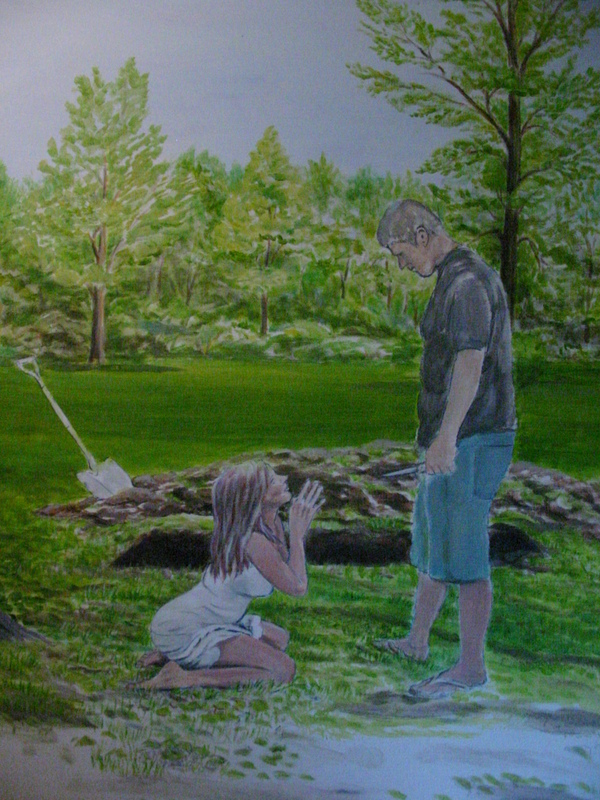 The open grave is behind them. 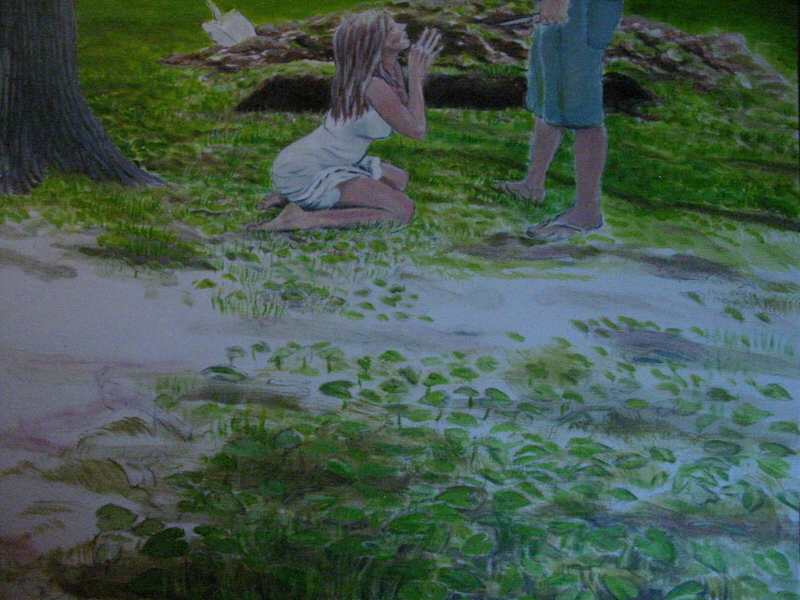 As you can see the figures aren't complete nor is the foreground where grass and forest plants grow in the shade of a giant oak tree. What is interesting is the shovel. It looks real and I haven't even painted it- I just painted around it! In the foreground is grass and leafy ground cover that grows in the shade. I got some plants from under a tree and set them in cup of water. This is going to take a loooong time. There's a large foreground area, whew! I've made the plants larger near the viewer to add prespective, it's hard to make it look real- I'm struggling.